Trusted in New Zealand for 30 years, and in the UK for the last 12! Geat for mums and children! Bee Balm is excellent for everyday use as a skin conditioner and barrier cream – especially for working hands. Propolis, used in Bee Balm, is increasingly referred to as ‘nature’s antibiotic’ – a marvellous natural substance utilised by bees to prevent bacterial infection in the hive. Vitamin E can help with the healing of burns and damaged skin. On application, the idea of ‘use less more often’ is one to remember. Massage/rub into dry areas properly, working in all the excess, rather than having too much. There are no Essential Oils or Almond Oil in Bee Balm which makes it the medium of choice for massage with clients who are nut allergic. 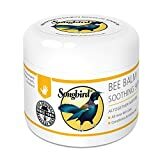 This entry was posted in Organic Health Products and tagged 100g, Balm, Songbird by Organic Health. Bookmark the permalink.